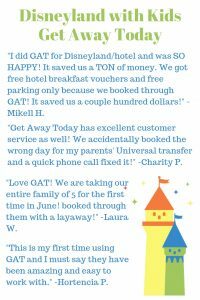 Disneyland with Kids is proud to partner with Get Away Today, the travel agency who started it all back in the 90s. Yes, that’s right, Get Away Today was the first travel partner to ever team up directly with Disneyland Resort for ticket sales! It’s a trusted partnership they’ve built for more than 20 years. 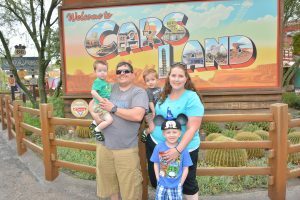 Why should you book your Disneyland vacation with Get Away Today? 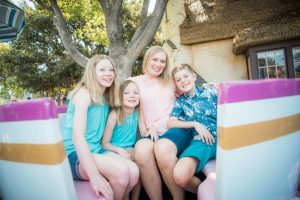 We have this discussion a lot in our Disneyland with Kids Facebook group, and we want to highlight some of those reasons here. Low price promise. If you find a cheaper deal, call 855 Get Away (be sure to tell them you’re with Disneyland with Kids) and they will match it! Even if the other deal comes with special perks . . . they will match it. Your quote from Get Away Today always includes taxes in the total so you know exactly what you’re getting into right upfront. Promo code DisneyKids will save you an extra $10 on your vacation or hotel booking. Discounted parking. This is one that typically gets left out. If you have a car with you, parking can cost about $20 per night at Anaheim area hotels, plus parking you might be paying at Disneyland Resort itself. Get Away Today deals often include parking discounts up to half off the normal hotel fee, but you might miss that because they don’t show a side-by-side comparison, it’s just automatically discounted. Select hotels offer 3rd or 4th night free only through Get Away Today. Select hotels offer free breakfast when other hotel guests might have to pay. Coupons, tons of them! My favorite (most valuable and likely to use) coupons include discounts for food at Downtown Disney quick service eateries and sit down restaurants. I’ve already mentioned Get Away Today’s low price promise. If you find a cheaper deal, call 855 Get Away (be sure to tell them you’re with Disneyland with Kids) and they will match it! Even if the other deal comes with special perks . . . they will match it. But did you know that if the price of your vacation drops before you leave they will also adjust it? There’s never a penalty for booking early. I totally dig that. Ready to book your vacation but not ready to pay it in full? For a small fee, Get Away Today allows you to make payments all the way up to 2 weeks before your trip. It’s a great way to lock in low prices, get the exact hotel you want and still save money. Another add-on is their in-house “Peace of Mind” travel protection plan. For a small fee you can adjust, change or cancel your trip without losing money. Ready to book your Disneyland Resort vacation and save? Are you a member of Disneyland with Kids? See what other group members have to say about Get Away Today in our group.